As a popular tourist destination, Lijiang boasts several public toilets located around town, though it will cost you 0.5 RMB (about 8 cents USD) to use one. Small villages inhabited by the Naxi minority people dot the countryside around Lijiang. A trip to one of these can be especially interesting, and many villages are accessible by bicycles, which you can rent in town. The first settlement on this site dates to the 13th century, though the name Lijiang wasn't attached to it until 1382, when the Ming Dynasty took over the region. The cobblestone streets of Old Town Lijiang are pedestrian-only streets, so bring good walking shoes. The historic town of Lijiang is nestled within one of China's most beautiful and diverse provinces, Yunnan. With a mild climate and fresh air that is famous throughout China as "eternal spring," this small city located close to Kunming, the capital of the province and the bearer of the nickname the City of Eternal Spring, offers idyllic scenery and a glimpse into China's traditional past. The Old Town of Lijiang is a UNESCO World Heritage Site and is well-known for its ancient canals and waterways, cobbled streets, traditional buildings, and vibrant minority culture. It is the main area inhabited by the Naxi minority group in China, whose influence is seen in the handicrafts, architecture, and culture of Lijiang. The Naxi also perform Dongjing music, a type traditional Taoist ritual music, in the Old Town of Lijiang. Visitors walking the cobbled streets of Old Town Lijiang will notice the city's distinctive architecture, which blends Tibetan, Han Chinese, and other local styles. The tiled roofs sweep up majestically into pointed corners and eaves, and the courtyard houses are intricately ornamented with carvings and paintings. Many of the traditional buildings house small shops showcasing local snacks and handicrafts, as well as fine tea shops. The canals of Lijiang crisscross the entire city, lined with willow trees and traversed by stone bridges decorated with carved dragons and animals. The town is a perfect place to spend a leisurely day exploring China's traditional culture. In addition to the charms of the Old Town, Lijiang is located close to some of China's most dramatic natural scenery. Tours to Kunming and Lijiang often include a trip to Tiger Leaping Gorge, a little less than 40 miles north of Lijiang, one of the world's deepest and most spectacular canyons. Jade Dragon Snow Mountain, located just outside Lijiang, offers one of China's most impressive mountain views, and the nearby Jade Water Village, located over a sacred spring flowing from the mountain, is a cultural center and home to a community of the Naxi tribal people. 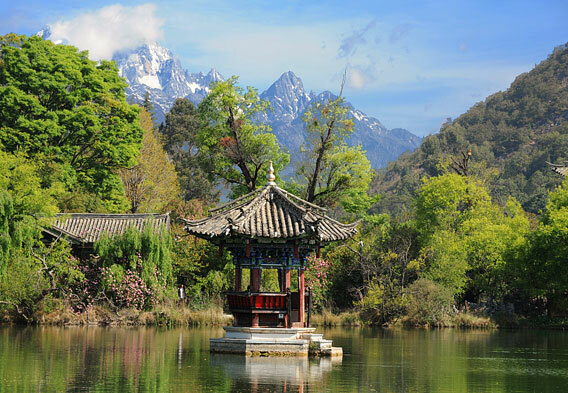 The Black Dragon Pool is located just a short walk from Old Town Lijiang. It is a beautiful calm pond with an excellent view of the massif at Jade Dragon Snow Mountain, regarded as one of the most striking vistas in China. It is also known as an outdoor architecture museum, with several ancient buildings that have been restored gracing its banks. The Moon Embracing Pavilion boasts a renovated white stone bridge perfect for photos, and the Five Phoenixes Temple showcases traditional Ming architecture. It's impossible to miss the tower of the Wangu Temple, as it is visible from almost anywhere in Old Town Lijiang. 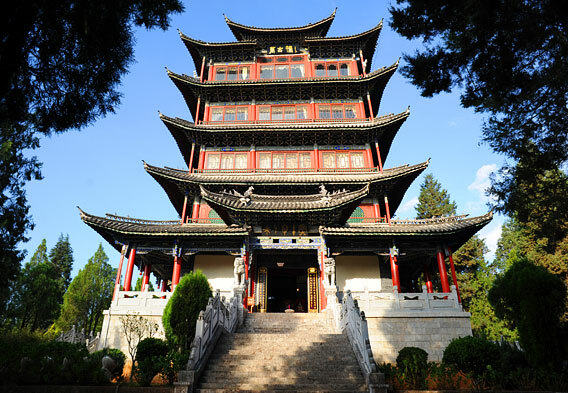 Set on top of Lion Hill, the tower provides panoramic views of Lijiang and the surrounding countryside. As a relatively recent creation, constructed to boost tourism, the temple itself has little historical significance, but it is a terrific vantage point for seeing the historic attractions the town does feature-the tower's top level has 13 angles to view from, with each one representing one of the thirteen peaks in the Jade Dragon range. Lijiang has a variety of restaurants serving almost every kind of regional Chinese cuisine. Especially pleasant are the cafes and restaurants that have patios right next to the canals and waterways. 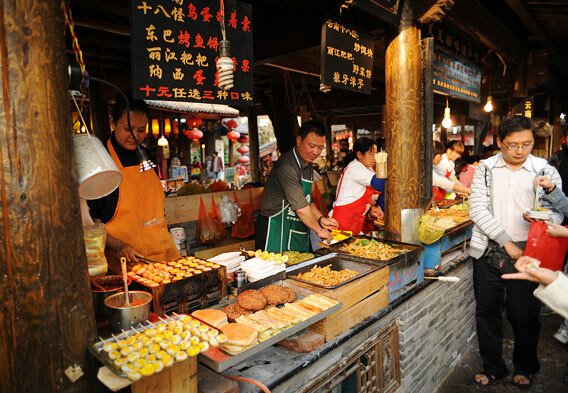 Local specialties include Lijiang pancakes, grilled fish, and vegetarian dishes. With influence from Tibetan culture, local Naxi cuisine also includes specialties such as yak butter tea-a must-try during a trip to Lijiang, even though it tends to be an acquired taste.